Matt wanted just one thing for his birthday this year, to upgrade from our El Cheapo smoker to something a little bigger and hopefully a little better. Don't get me wrong the El Cheapo served us well for two years, but it took a lot of attention to keep a good even heat. So, I present our latest toy, the Weber Smokey Mountain Smoker. 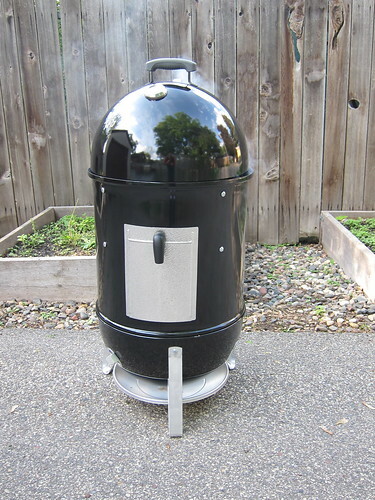 One of the main reasons Matt wanted this smoker is because you can get a temperature sensor fan unit for it. Now, he isn't planning on buying the unit that is for sale but making his own. Once it is done this smoker will keep should keep a good even smoking temp. Though we don't have the piece yet, he couldn't resist breaking in his new toy with these Smokey Pork Taco. The new smoker worked so well, it was able to hold a nice low temperature and used much less fuel than our old one. As for the tacos, they were smokey with a tang of lime and just a hint of peppers. The creamy avocado was the perfect paring for them. This is the kind of meal that really makes me feel like summer grilling and smoking season is here. Mix the garlic, ancho, chipotle, smoked and sweet paprika, cumin, lime juice and worchestershire sauce together. Microwave for about 30 seconds. Stir. Add in the tomato paste and olive oil. Butterfly the tenderloin and lay it flat. Remove any silver skin. Use a sharp blade to cut shallow slices down the length of the tenderloin. Put the tenderloin in a small ziplock bag. Add the marinade. Squeeze as much air as possible out of the bag. Seal. Massage the meat to work the marinade in. Let sit in the fridge for 3 1/2 - 4 hours. 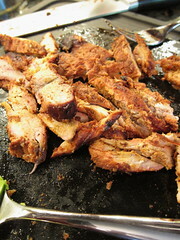 Slice the pork into strips. Serve on warmed tortillas with your choice of toppings. 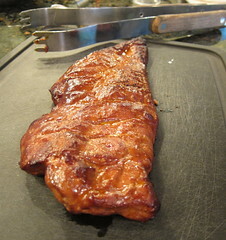 Oh man, how gorgeous is that pork?! I love the new smoker, too. Keeping the temp even is so important. I love grilling/smoking season! I've got the same smoker and love it! Make sure you check out virtualweberbullet.com also for more info on the new smoker, you'll love having it! Brent - Ah yes. Matt has been on that site already. I've been thinking about getting one of those smokers! 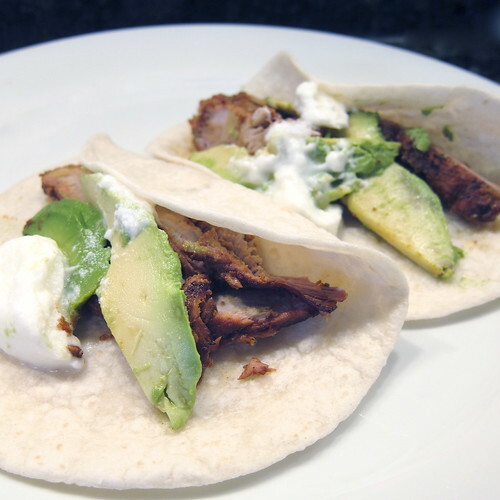 They look like fun, and your Pork Tacos recipe sure looks good. You may know about this already, but there's a website called the Virtual Weber (or something like that) that has a really good forum where barbecue-crazed guys (it's mainly guys) post about all things barbecue-related. It's from that forum that I first learned the joys & virtues of the Weber smoker. Worth checking out. (Disclosure: I have absolutely no relationship with that website, and haven't even visited it for awhile - just a neat resource I thought you might enjoy). Anyway, fun post - thanks. Kitchen Riffs - I bet its the same site Brent mentioned above. What a great way to break in the new smoker! The pork and the tacos look delicious! Happy birthday Matt! I wish I had a smoker like that. The things I could do! And those tacos look just amazing! I am just drooling over those tacos you guys! YUMMY!